Rubbermaid Paint Buddy Review- Is it a good painting solution? Does the Rubbermaid Paint Buddy Really Work? When it comes to home repairs that require painting and you have the right tools then the job isn’t so bad, and for afterwards you may find the Rubbermaid Paint Buddy comes in real handy. The Rubbermaid Paint Buddy is a tool that you will want to count on after your paint job is complete. It is a way to store paint for the future when you need to do touch ups. It is being promoted as being an easy use applicator for touching up paint areas. They are also promoting it as the ideal way to store the left over paint that you may need for this very task in the future. It is easy to use and convenient. Being able to store paint in a compact unit like this sure beats having to keep tons of paint tins on hand that only contains a small amount of paint just in case you need to do a touch up. The Rubbermaid Paint Buddy is not cheap and will cost you $88.95. You really don’t have to do anything special with the Rubbermaid Paint Buddy except remember to add your paint to it, and perhaps label it with the paint color codes just in case you need to buy more of that color. 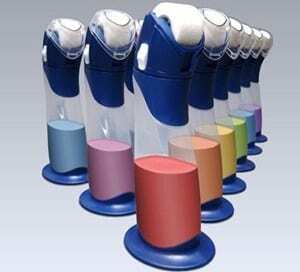 This is an ideal product to store the paint you will need for touch ups then you can get rid of those cumbersome paint tins. Overall a product like the Rubbermaid Paint Buddy is a good solution for storing the paint that you need for touchups. In addition to this though it makes doing those touchups easy because you can do it with the application applicator that comes with the paint buddy. There is no having to mess around with paint trays or rollers. The only work you will have to do after the paint application is clean the roller that is attached to the Rubbermaid Paint Buddy. We are going to give the Rubbermaid Paint Buddy a Try/Buy rating. There are a few problems and one may be that it is now hard to get. Also it is pretty pricey but there may be some alternatives. As with any products there are always a few generic ones that end up on the market. There is a version of this type of product called the Touch Up Painter which sells for a whole lot less on Amazon. It only has a few ratings however so these really can’t be relied on for feedback as yet. What it comes down to is convenience and are you prepared to pay a price such as this for being able to easily store your paint and then be able to apply it from the same product? If you don’t mind the clean up that it takes using the standard method of touch ups, then you really can store your left over paint for this purpose in any air tight container. Painting jobs are usually big jobs and having any tools that will help you get the job done easier is a bonus. One that we think may help is one that we reviewed in the past called Rapid Edge. What do you think? Does Rubbermaid Paint Buddy work or not? Does Aquaponics 4 You Really Work? Does Ideas 4 Landscaping Really Work?